Victorian spout is designed with an antique elegance. The high spout is ideal for large pots. Fabricated from solid brass material for durability and reliability. Adjustable installation 3-1/2 to 8-1/2 in. Full collection carries old world charm through an entire home. Soft curves offer a timeless design. 9 high spout swings 360 for added convenience. Matching soap dispenser for coordinated look. Single lever handle for ease of control. Available in store by Special Order Only. See associate for details. Unmatched style and functionality define the Aberdeen Kitchen Faucet from MOEN in a design that is stunningly simple, classically elegant. The ergonomically designed pull-down spout fits comfortably in your hand and comes equipped with a pause button to temporarily stop the flow of water, perfect for multitasking in the sink. Aberdeen also features Reflex technology, a comprehensive system of design enhancements engineered specifically for pull-out and pull-down movement by undocking easily, moving with you and retracting effortlessly when you're done. Victorian 2-Handle Kitchen Faucet in Oil Rubbed Bronze Victorian spout is designed with an antique elegance. The high spout is ideal for large pots. Fabricated from solid brass material for durability and reliability. 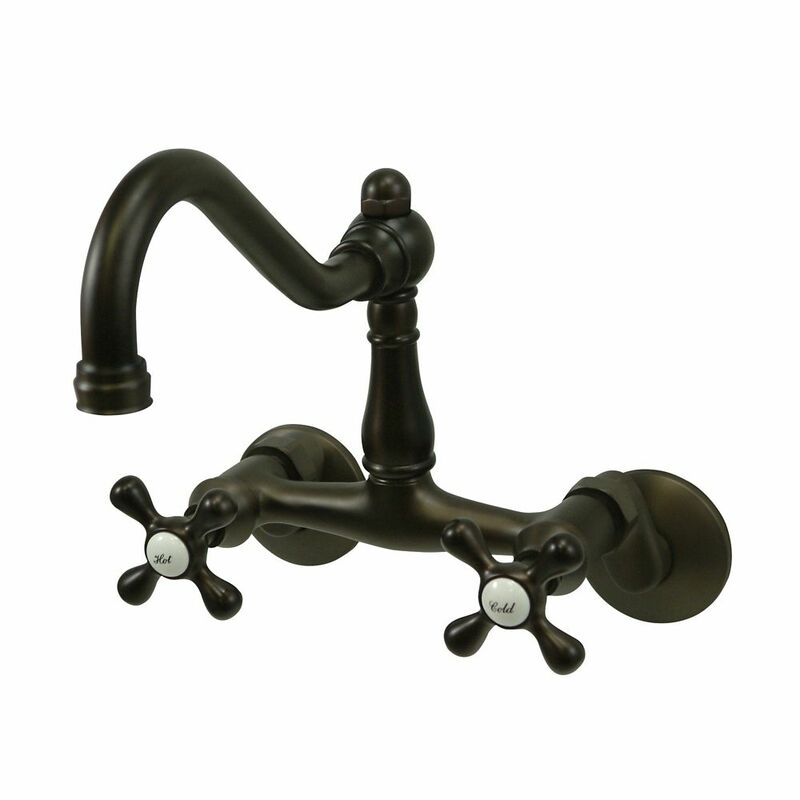 Victorian 2-Handle Kitchen Faucet in Oil Rubbed Bronze is rated 4.6 out of 5 by 10. Rated 5 out of 5 by Howard from I installed this faucet in three kitchens of my rental... I installed this faucet in three kitchens of my rental property, including a 105-year-old duplex. The installation was easy, they look great, and along with bronze finish lighting fixtures, really made each kitchen a standout. Rated 5 out of 5 by Anonymous from Fauset bronze I am so amazed with lthe looks and quality!!! It so Heavy! I'm so happy I bought it!! I think it is almost the best purchase I made in all fauset for our new home!!! Thanks Home Depot great service all time!! Rated 5 out of 5 by TAC from Beautiful and functional! Installed two years ago and still looks new! Beautiful and functional! Rated 5 out of 5 by winter from Looks so nice in bathroom vanity! I searched the web for this look and found the price was $100 less expensive than others! Very happy with the product. Also, spout moves side to side which is nice. Rated 5 out of 5 by Apse from Great value and look Good quality. Looks sharp and easy to install. It looks almost black though, not oiled brass. Rated 1 out of 5 by Robb from Check the Width The oil polished bronze is almost black in color. We were replacing a wall mounted faucet manufactured by Kingston that had a lighter oil polished bronze finish. Home Depot only carries a six inch width installation and we needed eight inch. We have to get that directly from the manufacturer. Why not carry an eight inch wall mount?